Join us for a special Valentine’s Dinner & Dance. Meal catered by Sweet & Savory (grilled chicken, mashed potatoes, & broccoli salad with dessert). Live music by 421 West. 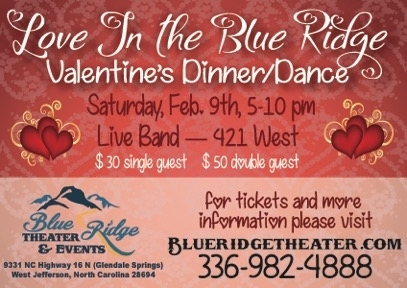 Tickets & info at www.blueridgetheater.com; $50/couple, $30/single, Singles Group Special $200/table of 8. Encouraged to pre-purchase for meal; tickets are available at the door with limited meals available at a first-come, first-serve basis. For just the music and dancing, tickets $15/person beginning at 6:30pm at the door.